EXPLORE THE ORCHARD — Martin Salomon Jr.
You guys really have no idea how happy I am that the Fall is finally here! To celebrate the arrival of Fall I took a quick trip upstate to explore Angry Orchard in Walden, NY; right before their 2nd Annual Angry Orchard Harvest Fest which took place on Saturday, September 23rd. This was a special experience for a small group of us. Below you’ll read what I wrote in journal during my stay. “My day has started. I’m officially excited. I’m waiting to be picked up by a car that will take me on a two-hour ride to Walden, NY. The car is here and we’re on our way. I figured two-hours was a pretty long time to sit in a car however that time flew by really fast because of the amazing views I got to see along the way. The views definitely brought back a sense of nostalgia as I thought about my home-state Texas. I think I’m starting to miss the Long fields with the cute old houses surrounded by big old trees, ahh! We’re here! I arrived to the Orchard right around the same time as my friend Melissa. We were both welcomed by an amazing team at Angry Orchard. While we waited for a few others to arrive, we got to enjoy some Crisp Apple hard cider, their original style, and begin to meet the rest of the team. About a half an hour later the rest of the group finally arrived. We introduced ourselves to one another and found that there was a diverse group of individuals experiencing the day: some were Photographers, YouTubers, Food Bloggers, etc. I loved that even though we represented a different creative backgrounds, we were all here together to experience and explore the Angry Orchard. After introductions we were then introduced to Ryan Burk (Head Cider Maker) or also known as the coolest guy ever. 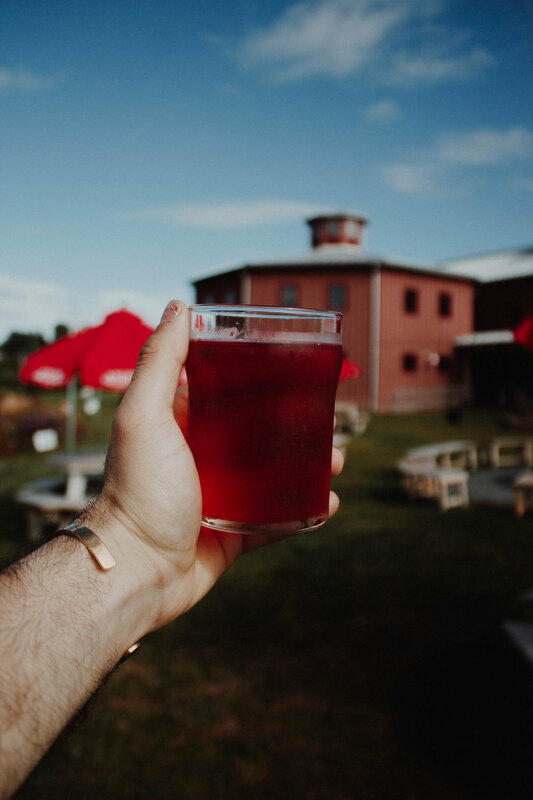 During his tour of the Orchard he showed us how cider is made, the varieties of cider that they make, and we learned about the background of the Orchard while tasting several different types of cider that won't be released to the public until next year! Following this insightful moment it was now time for dinner. The dinner was prepared by a very talented chef, James Rigato of Mabel Grey, yumms! Each plate was paired with a cider which only enhanced the meal. Being that I love food you can only imagine that I was heaven; did I forget to mention that there were 8 courses? I think my favorite cider was the Traditional Spanish Cider Pour. Get this.... we had to literally pour a shot of cider straight from the barrel, sip it, then dedicate that shot in the name of the dead. If you're Spanish then you will know why we do that. To end off our magical day we sat around a bonfire and watched the most gorgeous sunset followed by the new moon. Shortly after that we picked up some swag and got our own choice of cider to take home with us! I choose the Baldwin SVC 7.9 Hard Cider and it is sold exclusively at the Orchard. 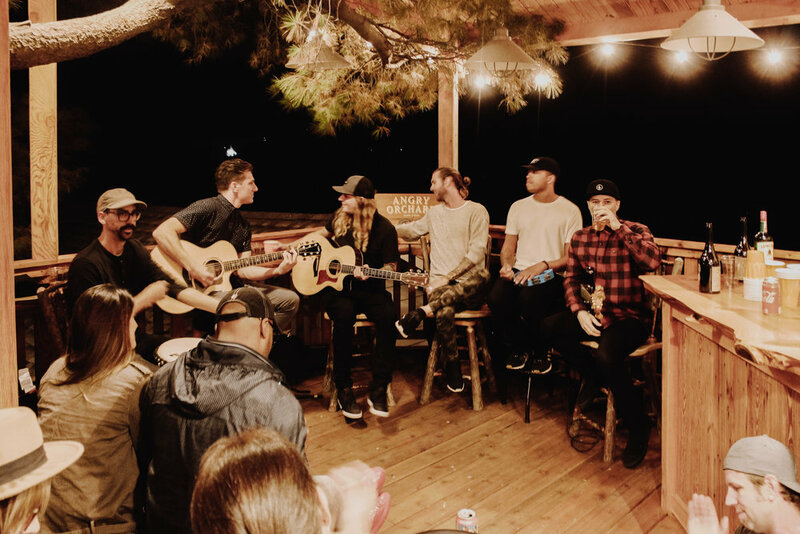 And Lastly, I think the highlight - for me at least, was the private acoustic concert by the Dirty Heads. We listened to some great music while gazing at a beautiful view from the Treehouse!" It's not a Good-bye but a See You later! This wonderful experience made me so happy that I cannot wait to go back and experience it all over again! I recommend that you go visit the Orchard in Walden, NY. Trust me, you won’t regret it and if you can go to Harvest Fest, a music festival at Angry Orchard that happened this past weekend and will be happening again next year,I will see you there. We will be sipping hard cider while listening to some good music. To the team of Angry Orchard, I just have to say that I’m super grateful. Thank you for letting me experience all this, I had a blast and super happy I got to do it with pretty rad people.